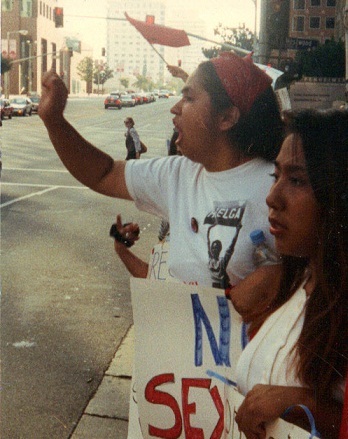 UFW Stories: "Inspiring a Student Movement"
I was born and raised in San Francisco’s distrito de la Mission, I grew up hearing the word HUELGA. I remember asking my dad, why people formed picket lines outside Safeway Supermarkets in San Francisco. He would tell me, “hija, la gente esta en huelga, estan boicoteando las uvas.” I didn’t realize it then, that one day that I would work for the United Farm Workers. I worked for the United Farm Workers for almost 7 years. In 1993, I attended Clark University in Worcester, Massachusetts. In the fall of 1994, Richard Chavez spoke at Clark University. He touched me so much that I was inspired to write an article in the school newspaper about the plight of farm workers and the grape boycott. In the summer of 1994, I volunteered for the United Farm Workers in San Francisco, where I met Eva Royale and Giev Kashkooli. When I returned back to college in the Fall of 1995, I was determined to help farm workers and organize to bring Dolores Huerta to my campus. I remember calling Giev letting him know that I was interested in bringing Dolores Huerta to my campus to speak. Giev informed me that the honorarium to bring Dolores is $5,000. I told Giev that I had $4,000 already and that I was still working in confirming additional funding. He couldn’t believe it. I organized to bring Dolores Huerta to speak and I raised over $6,000 for her honorarium. I was so inspired after her speech that I decided to go with her to finish off the rest of her speaking tour in New England. I left everything behind. During those days, I learned so much that I decided to leave college and joined the United Farm Workers. I realized that my passion in life was to help farm workers. I remember all the stories I heard from my abuelitos when they were farm workers. I started working with the Union in New York, I was trained by Giev Kashkooli and other staffers. I was relocated to La Paz, where I was Irv Hershenbaum’s assistant for a few months. It was then that I started organizing the UFW’s Statewide College Conferences every year. I was then relocated to Los Angeles in 1996 to assist Magdaleno Rose-Avila, Executive Director of the Cesar Chavez Foundation at that time and helped organize the Annual Cesar E. Chavez Legacy Dinner. After the Legacy dinner, I started working with Roman Pinal in the Los Angeles Public Action/ Boycott Office as a Organizer/ Student Coordinator of Southern California. At the end of 2000 I was relocated to San Francisco where I worked with Eva Royale at the UFW San Francisco Public Action Office as an Organizer/ Education Coordinator. I also coordinated the Cesar Chavez Art Poetry and Essay Contest where I spoke to over 10,000 K-12 students all over San Francisco. I stopped working with the UFW in April 2002. I still volunteer from time to time to help farm workers. I help Eva with the Cesar Chavez Parade and Festival every year in San Francisco. I’ve learned so much working for the United Farm Workers. It was more than a job; it was familia. Viva Los Campesinos! Viva Cesar Chavez! Viva Dolores Huerta!